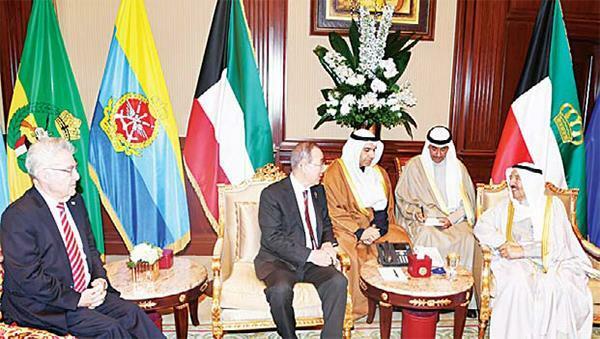 KUWAIT CITY, Feb 11, (KUNA): Former secretary-general of the United Nations Ban Ki-Moon on Monday voiced much appreciation to His Highness the Amir Sheikh Sabah Al-Ahmad Al-Jaber Al-Sabah's leading role in global humanitarian activities and Middle East mediation efforts. Ban, who is the current chairman of the Ban Ki- Moon Centre for Global Citizens, made the remark in a press statement following a meeting with His Highness the Amir. 'We really appreciate the strong support from the Kuwaiti Government for the activities of the global citizenship centre. I also highly appreciate and commend the great leadership of His Highness for his peace and mediating role in this area, particularly for the Yemen conflict as well as the Iranian issues, also some dispute between Saudi Arabia and Qatar,' he said. 'The peace and reconciliation in the Gulf area is crucially important, he assured us that he will continue his mediating role and Kuwait is now acting as the United Nation's Security Council member and now chairing the Security Council in the month of June,' Ban added. He went on to say: 'We hope that the Kuwaiti government and delegation will continue to contribute to world peace and stability and development through their very active diplomatic activities in the Security Council.' The former UN chief said it was a great honor for him to visit Kuwait on the occasion of the 40th anniversary of the independence and the 13th anniversary of His Highness the Amir's succession. He noted that his center would hold a major meeting Tuesday on women's empowerment and promotion of young people's role, pointing to a meeting held Monday with Kuwaiti charities. Former Austrian president Heinz Fischer said on Monday that His Highness the Amir completely backs the humanitarian and development goals of Ban Ki-Moon Center for Global Citizens. 'His Highness expressed his satisfaction so that we can say it was a very friendly and a very successful meeting,' he noted. His Highness the Amir, meanwhile, patronized the exhibition 'Al-Fahad … Spirit of Leadership' and operetta 'Deeprooted Brotherhood at Jaber Al-Ahmad Cultural Center, with His Highness Crown Prince Sheikh Nawaf Al-Ahmad Al-Jaber Al-Sabah attending. His Highness the Amir was welcomed by Prince Mohammad bin Fahad bin Abdulaziz Al-Saud, Prince Saud bin Fahad bin Abdulaziz Al Saud, Prince Faisal bin Saad bin Abdullah Al-Saud, Prince Faisal bin Saud, Prince Turki bin Abdullah Al-Saud, Prince Nawaf bin Faisal bin Fahad bin Abdulaziz Al-Saud, Prince Abdulaziz bin Saud bin Fahad bin Abdulaziz Al-Saud, Prince Khaled bin Mohammad bin Fahad bin Abdulaziz Al-Saud, Prince Abdulaziz bin Mohammad bin Fahad bin Abdulaziz Saud, Prince Mohammad bin Saud bin Fahad bin Abdulaziz Al-Saud, and members of the higher organizing committee. His Highness the Crown Prince Sheikh Nawaf Al-Ahmad Al-Jaber Al-Sabah and Prince Mohammad bin Fahad bin Abdulaziz Al-Saud toured the 14-pavilion exhibition which focuses on the biographay of the late Saudi King Fahd bin Abdulaziz Al-Saud, mainly his positions and achievements, along with Saudi-Kuwaiti relations.